As craft beer booms and breweries and brands multiply, TapHunter turns beer geekery into vital business information while Untappd and Pintley show breweries what's working and what isn't. PORTLAND, Ore. (TheStreet) -- In a nation where breweries number in the thousands and barroom taplists can stretch into the dozens, what beer lovers drink and where they drink it matters. Apps such as Pintley function as a beer Amazon, stocked with recommendations that point beer drinkers toward their next favorite style or brand. Untappd has become beer's FourSquare, with users snapping pictures of their pints, checking in their drinking locations and loading up on badges for beer-based accomplishments. That's all lovely, but it sits on a pile of data that brewers, bar managers, distributors and bottle shop owners would love. Slowly, those data are starting to leach out. San Diego-based TapHunter maintains a database of more than 30,000 unique beers with the express purpose of helping beer drinkers find them at their local bars, restaurants, supermarkets, bottle shops and elsewhere. In core markets including and surrounding San Diego, Los Angeles and Anaheim, Calif., Phoenix, Ariz., Denver, Seattle, Atlanta and St. Louis, the folks behind TapHunter open their app to breweries to ensure that beer names, availability, alcohol content, bitterness and other valuable data are displayed clearly and accurately. That's just fine for brewers and beer drinkers, but it works out particularly well for bars and restaurants (on-premise accounts) as well as grocers and bottle shops (off-premise locations) all trying to stay on top of a notoriously fickle craft beer market. "Those are all of the valuable pieces that the on- and off-premise accounts are looking for because they don't have the time to spend searching around Google and BeerAdvocate for all that info," says Melani Gordon, chief executive and co-founder of TapHunter. "What we discovered was that the brands wanted to make sure that information was correct not only for consumers, but for on- and off-premise accounts." This is what beer data looks like. Bars, restaurants and shops update their offerings through TapHunter -- which, in turn, updates app listings, social media feeds and even in-house digital menus in real time -- and watch their account's stats page for trending information. 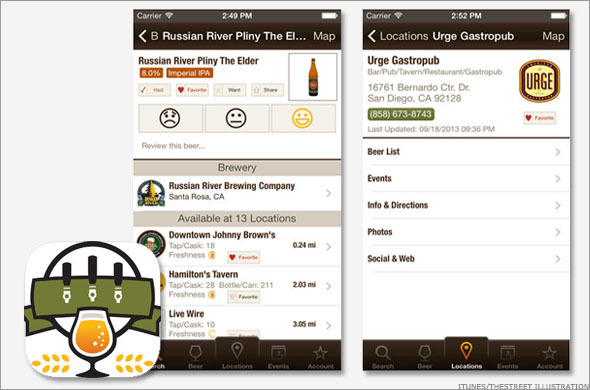 The app keeps a rolling 30-day archive of which beers are trending in the surrounding area, as well as the beers that are drawing app users to a particular bar or restaurant. Whether it's Russian River's Pliny The Elder or a brewpub's everyday IPA drawing the masses, the app takes note and tells businesses what's working and what isn't. That's no small issue in an evolving beer industry. The Beer Institute industry lobbying group in Washington, D.C., says the U.S. now has a record-high 3,699 active "permitted breweries" overseen by the Alcohol Tobacco Tax and Trade Bureau. That's slightly out of line with the Brewery Association craft beer industry group's count of roughly 2,800 breweries, but either of those numbers would still be a whole lot. BA's total would exceed the 2,685 breweries that appeared on the Register of United States Breweries in 1876, but the Beer Institute's would surpass the receord 3,286 that existed in 1870. That doesn't mean that all is well in beer world. It's also a whole lot of new entries into what is, ostensibly, a shrinking market. Consumer research firm Technomic notes that craft beer production for all of last year grew 10%, while overall beer production slid 1.4%. Meanwhile, GuestMetrics reported that 2013 on-premise craft beer sales in bars and restaurants rose just 3.8%, which is well below the growth rate for store-bought beer. The news isn't so great for craft beer on tap handles, either as Restaurant Sciences just reported a 4% drop in craft beer sales earlier this year. From here, according to a report by consumer research firm Mintel, beer sales by volume are expected to rise by just 4% during the next four years after a post-recession stretch of flat sales or losses. Meanwhile, The Beer Institute compared unemployment rates with average monthly beer shipments during the same period and found that overall shipments began decreasing steadily in 2009 and continued through June of last year in direct correspondence with job numbers. An entire class of beer drinker was priced out of his or her favorite brands. The folks who can buy beer aren't buying more of it, just more expensive kinds. Mintel notes that craft brewers introduced more than 1,000 brands last year, many at higher prices. Mintel forecasts that those price increases will boost U.S. beer sales 2.4% from $83 billion last year to $95 billion in 2018 -- but only if drinkers can find the beers they seek at their local bars and shops. "Half the reason they're carrying this product is because of the higher profit margin and that it attracts a more discerning customer," Gordon says. "If no one knows what you have, how do you bring those customers in and keep them coming back?" That's where the money comes in. While the app is free for brewers and consumers, bars and bottle shops have to buy in to reap its benefits. Monthly packages range from $29 a month to $99 a month and vary from simple beer updates to beer, spirits and cocktail packages, print menu design, digital displays, tablet menus and more. Right now, businesses from growler-filling stations to geek-driven bottle shops with more than 1,000 varieties are buying into it, with TapHunter testifying that its service is saving businesses 30% to 75% of staff hours they no longer have to spend on updates and promotion. But what's the biggest return on investment? Gordon says it's the businesses seeing their $99 package paying for itself five times over through customers who found their establishment through TapHunter. The data are the commodity, but that consumer end of the app is still dangled as the reward. "It's exposure for the bar, it's exposure for new brands so brands love it as well," Gordon says. "The information that the consumer is giving us is the brands that they like and their favorite locations, so we report that information back to the on- and off-premise accounts." But they can't get everyone. Right now, TapHunter is still exploring its options in other markets and slowly building its network a town at a time. Its presence east of the Mississippi is small and even western markets in Oregon, Colorado and elsewhere are still developing. Also, while the data TapHunter culls are valuable, it's still a fraction of that culled by a site such as Untappd, which founders Tim Mather and Greg Avola have geared primarily toward consumers and brewers. It's a dense log of what drinkers are drinking and where, but its data currently has minimal business applications beyond what it can do for breweries looking for more brand exposure and better beer portfolios. Untappd represents the next big step for beer data, and even the folks behind TapHunter realize its potential. "Untappd ... talk about two guys who were able to rally the most fanatic beer users in the country or maybe the world," Gordon says. "It's the FourSquare of beer and we love what those guys are doing, but they're not providing a lot of tools for the businesses right now -- it's more consumer-oriented -- so we saw a big opportunity to help out on the business side. They're great for the industry, they're great for us and we're great for them, so there could be a great partnership there, to be honest with you."